Australia’s largest pizza maker, Domino’s is shouting Melbourne locals lunch for an entire week, offering customers free pizza* at selected stores from Monday 17 September to Sunday 23 September 2018. 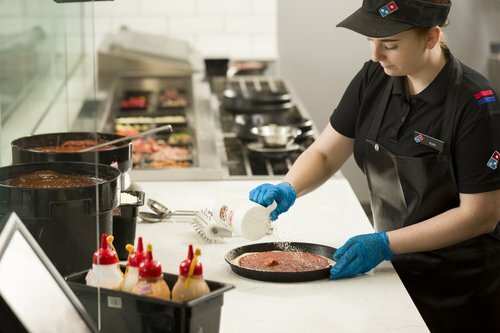 Domino’s CEO for Australia and New Zealand Nick Knight said customers can choose from some of Domino’s most loved pizza recipes including Supreme, Hawaiian, BBQ Meatlovers, Simply Cheese and Spicy Veg Trio. “We want give back and say thank you to our local customers and to the Melbourne community, and what better way than with food?” Mr Knight said. “It’s also a great opportunity for those who have never eaten Domino’s to give us a try. “From 12pm to 1pm each day throughout the week, customers can enjoy a pizza on us at various Domino’s stores across Melbourne. Customers can enjoy a free pizza (limit one per person per day) from a selected range at the below Domino’s stores from 12pm to 1pm. For more information on Domino’s, visit www.dominos.com.au. Domino’s Pizza Enterprises Limited (DMP) is Domino’s largest franchisee outside of the USA. It holds the master franchise rights to the Domino’s brand and network in Australia, New Zealand, Belgium, France, The Netherlands, Japan, Germany and Luxembourg. Today, DMP has a network of more than 2,400 stores.